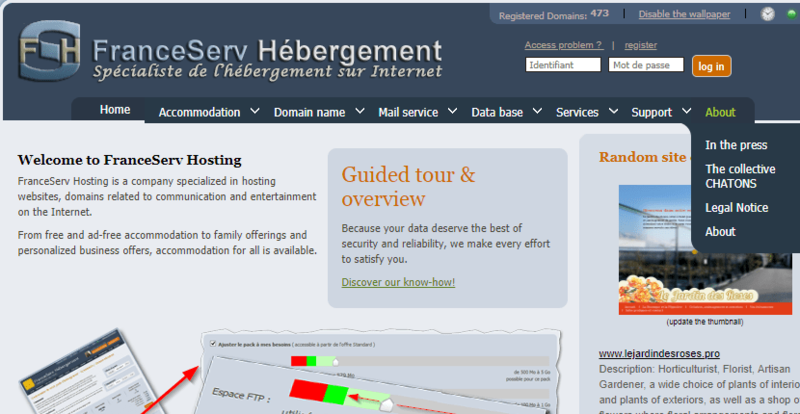 FranceServ Hebergement Review 2019: Is FranceServ Hebergement a Good Hosting? FranceServ Hosting is a privately-owned company that was founded in 2004 by Élodie Bossier. Initially, they offered free hosting and domain management, but later on they introduced premium hosting packages to meet the growing demands of customers. With over a decade of experience in the hosting industry, FranceServ Hosting is a small hosting company that specializes in web hosting and domain registration services. They offer simple and ad-free hosting plans to French customers. As a small hosting provider, they only have three shared hosting plans for you to choose from. If you’re starting out, I recommend their Discover plan with 1 GB storage space, 1 GB mail storage, unlimited traffic, and five MySQL databases. You can use it to host a simple database-driven website that can support a decent amount of traffic. Their Standard plan is meant for gaming websites, blogs, and CMSes — so if you’re planning on using WordPress, this would be your best bet. Finally, their Pro plan is meant for small to medium enterprises and larger organizations with more complex database needs. However, do note that even though their Pro plan can support far more databases, FranceServ Hosting is still a small provider without the capabilities to meet the most stringent criteria for certain organizations. Sadly, none of their plans include support for CGI and Perl. While they do have a one-click installer available, they don’t have a website builder for beginners. They also don’t appear to have an uptime guarantee, although my quick tests yielded an average uptime of 99.93% for the last few months. Though easy to navigate, FranceServ Hosting’s website appears to be coded entirely in HTML, which makes it look dated. It’s not mobile-responsive, which may also indicate that their hosting infrastructure is similarly outdated. Elodie needs to redesign her company’s website and make it mobile-friendly. The text is too small. I had to zoom in from the browser to be able to read the content. I would really appreciate if Elodie or the tech guys can rework the website and create an English version. For a European hosting provider, FranceServ Hosting’s packages are priced inexpensively. If you’re looking for low-cost shared hosting with basic features, FranceServ Hosting may be just the thing for you. There are also add-ons available for purchase, so you can customize your packages as you wish. You can pay for your hosting package conveniently using MasterCard, Visa, PayPal, bank transfers, Western Union, Discover, and American Express among others. As a solo enterprise, Elodie runs all the operations at FranceServ Hosting, including customer service. You can reach her via IRC chat, a contact form on the website, or create a thread on the company’s forum. Telephone support is available from 9.00am-11pm, Monday to Friday. From what I saw on the forum, she provides detailed answers, clarifications, and tries to resolve issues within an hour. How she’s been doing that for 8 years is beyond me, but she’s clearly at the top of her game. For a reasonable fee, you can get stable hosting with a decent array of features and personal support at FranceServ Hosting. Wondering how FranceServ Hebergement stacks up against other Web Hosting companies? Enter any other Web Hosting company and we will give you a side-by-side comparison.